A quick heads up, if you haven’t heard about the new CSSLint project from Nicole ## and Nicholas Zakas, you have been missing out. The project aims to take CSS to the next level and help you understand why your css isn’t performing very well. What, you didn’t know your CSS isn’t performing? Thats because most of us haven’t had a good Code Review on most of our CSS. I talked with Nicholas at the Velocity conference and decided I would put together a quick CSSLint TextMate Bundle that could make use of the Node Module for CSSLint. After a couple of hours playing with the way TextMate Does its bundles, I was able to get a working product. 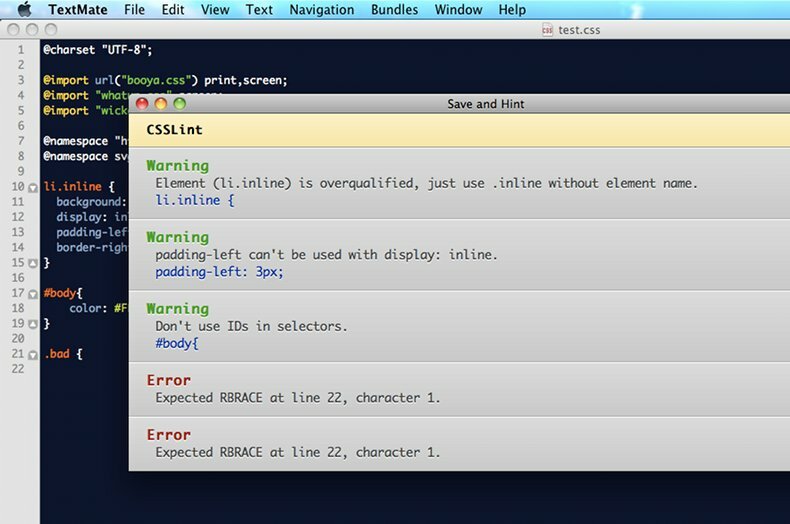 A Couple of quick emails back and forth and we have a Beta version of the CSSLint TextMate Bundle. Installation is simple. Just download this file CSSLint TextMate Bundle. Unzip the contents, and then rename the file to csslint.tmbundle. Once you have renamed, just double click on the icon, and it should automatically add it to TextMate. You need Node.js and TextMate, that’s all. This bundle uses #!/usr/local/bin/node to launch the node process. If you get a node – not found error,the PATH variable is probably not setup in TextMate. A couple of quick highlights. Feel free to contact me about any features you would like to see in the bundle. Or submit a pull request and I will take a look. I am having the same issue as above. Have you found the solution for this? Can you try doing a “which node” from the terminal and tell me where its installed? It seems maybe the path is incorrect? Or you two need to update to the latest nodeJS? Just downloaded this. Seems pretty awesome. One thing I’d recommend is to somehow make this SASS/LESS sensitive since those will pitch all kinds of lint errors, esp on the Save and Lint command. Depending on how you have those scoped, it may or may not be a problem. For example, SASS as source.sass wouldn’t have an issue, but source.css.sass (like I have) lints everytime I save. Matt, you can submit a pull request to the github repository for the change. Otherwise, I will see what I can do about getting it fixed! The bundle “csslint.tmbundle” does not contain the required “info.plist” file (or that file is corrupt) and can therefore not be installed. Is there another dependency I’m missing?